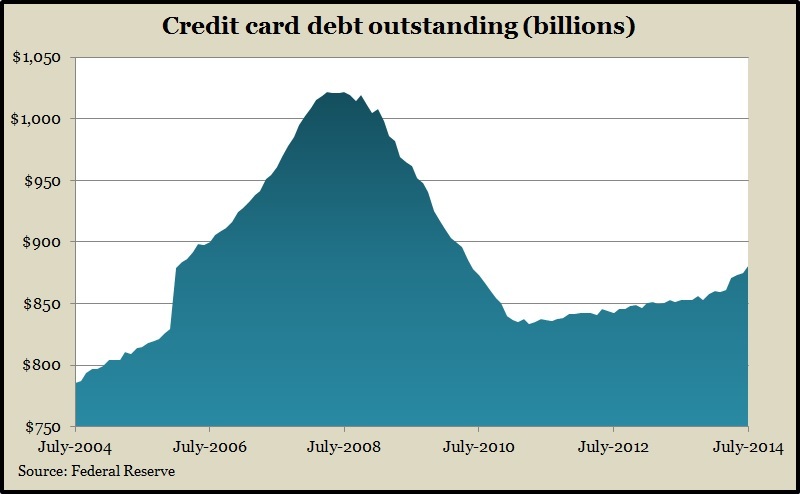 In a possible sign of freer consumer spending, credit card debt rose for the fifth month in a row in July. The Federal Reserve reported that overall consumer debt continued growing, led by auto financing and student loans. But revolving debt, which represents credit card use, increased to the highest point since May 2010. Consumer spending drives about two-thirds of U.S. economic activity. Wholesale inventories grew 0.1% in July, the fourth month in a row of diminished gains, according to the Commerce Department. Meanwhile, sales increased 0.7%, thus lowering the inventories-to-sales ratio, which indicators leaner operations that may need to ramp up production – perhaps even hiring – in coming months to keep up with demand. In a continued sign of employers’ reluctance to lose workers, the moving four-week average for initial unemployment claims remained below its 47-year average, as it has since the beginning of 2013. The Labor Department reported a slight trend up in the claims in four of the last five weeks, but for now, applications suggest a relatively healthy employment market. In another sign that consumers are participating in economic growth, retail spending rose in July for the seventh month in a row and at the fastest pace since April. The Commerce Department reported that all but two 13 retail categories increased sales in July, with general merchandisers and gas stations the only exceptions. Sales overall were up 5% from July 2013, which exceeds the 30-year average of 4.6% and was the highest in 13 months. In a separate report, Commerce said business inventories rose in July for the 16th month in a row. Sales made even greater gains, helping businesses keep supplies from outrunning demand.